Manifestly is an integrated checklist solution with native Android and iOS applications. It is dedicated to recurring tasks, enabling teams to focus on performing their assignments rather than recreating their checklists from the previous day, week, month, or year. With Manifestly, team members also rely on a streamlined Slack integration to communicate seamlessly with each other. The checklist tool supports a connection with the team communication and management service, allowing managers to assign tasks and supervise their team without sending a plethora of emails. Additionally, Manifestly allows teams to further enhance their workflows. That is because the application has an open API and lets it access a variety of third-party services through Zapier, letting teams do more from one interface. 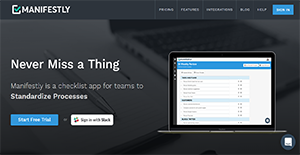 Manifestly is the only checklist tool whose main focus is the management of recurring tasks. With this application, organizations that have to repeat certain assignments daily, weekly, monthly, or even manually do not have to create a new checklist every time. The solution supports duplication or replication of checklists so users only have to make updates to their workflow when needed. With Manifestly, teams can connect with each other and with external collaborators through third-party communication tools. They no longer have to exchange or keep track of email threads as they can simply update the relevant persons through Slack. This integration also lets managers assign tasks and manage other delegated responsibilities without leaving the application. Moreover, Manifestly can connect with a wide variety of applications through Zapier. This lets teams create custom connections with their existing and future software to further enhance their productivity. Manifestly is accessible natively on iOS and Android devices. This lets team members view their checklists and make necessary changes whenever they need to even when they are outside of their office premises. This enables teams to work efficiently since members waiting for others to finish their tasks can continue with their own immediately as soon as checklists are updated. What Problems Will Manifestly Solve? An IT manager or DevOps operator may only be allowed to provision a new server once in every few months. This causes a lot of delay in launching servers and in the process, certain steps can be forgotten. With Manifestly, they can delineate their tasks beforehand and check back on them when the time comes, enabling them to complete everything that is necessitated. Whenever a new employee is hired, the HR can complete the necessary on-boarding steps smoothly. This lets them acquaint the new hire with security measures, company rules and regulations, and other things seamlessly since they have outlined steps to follow. The same can be said whenever an employee leaves the company. HR team members assigned in ensuring that the resigning or retiring employee complete required forms and receive important documents and remunerations without errors. Manifestly assists accountants in going through a checklist every end of the month. This lets them make certain they do not miss important financial details that are detrimental to the organization or the company. Companies have different needs and requirements and no software application can be just right in such a scenario. It is useless to try to find a perfect out-of-the-box software product that meets all your business requirements. The wise thing to do would be to customize the application for your unique needs, staff member skill levels, budget, and other aspects. For these reasons, do not hurry and subscribe to well-publicized popular systems. Though these may be widely used, they may not be the perfect fit for your particular needs. Do your homework, check out each short-listed platform in detail, read a few Manifestly reviews, speak to the maker for explanations, and finally select the application that provides what you want. How Much Does Manifestly Cost? A free 30-day trial is available for all plans. Non-profit organizations and educational institutions can avail of a 50% discount regardless of their subscription plan. For more information, contact sales. We realize that when you make a decision to buy Collaboration Software it’s important not only to see how experts evaluate it in their reviews, but also to find out if the real people and companies that buy it are actually satisfied with the product. That’s why we’ve created our behavior-based Customer Satisfaction Algorithm™ that gathers customer reviews, comments and Manifestly reviews across a wide range of social media sites. The data is then presented in an easy to digest form showing how many people had positive and negative experience with Manifestly. With that information at hand you should be equipped to make an informed buying decision that you won’t regret. Great checklist app for managing tasks between team members! What are Manifestly pricing details? What integrations are available for Manifestly? Manifestly seamlessly integrates with Slack. At the same time, the solution has an open API that allows it to connect with Zapier, allowing clients to synchronize with over 750 third-party services. If you need more information about Manifestly or you simply have a question let us know what you need and we’ll forward your request directly to the vendor.